How would partnering with a human resource consultant benefit you? Our clients say they have more time to focus on their business, have a better understanding of their team and a reduction in operating expenses. We believe in responding to human resource challenges with precision and passion. It’s just what we do. Scott Human Resources provides real solutions to your needs while building relationships that last. Let us create a custom strategy to improve your bottom-line dollars, raise employee engagement and ensure legal compliance. Let’s talk about what Scott Human Resources can do for you! Complete the contact form to schedule your free, one-hour consultation with one of our hr experts. 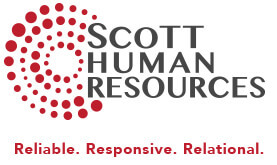 Scott Human Resources can be your partner with reliable, professional HR services that will benefit your business. What is your most pressing HR concern?